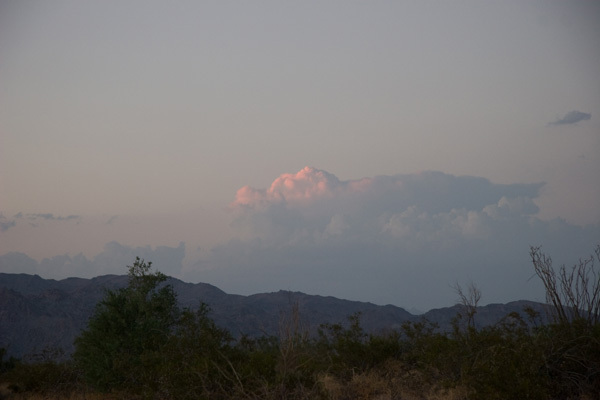 We hadn’t expected to be able to observe during this part of the summer from Chuckwalla Bench in the High Colorado desert south of Joshua Tree, but this August night’s forecast at Desert Center looked very inviting. The forecast high there was 101°F with a low of 74°F. I believe our actual location is at a higher altitude; it always seems at least a couple of degrees cooler. It was forecast to be breezy though, and that can make it uncomfortable to observe as well as blow telescopes and tripods around. We did have some periods when the wind was a nuisance, but for the most part it was pleasant t-shirt and shorts weather all night long. I caught this great lightning bolt from the distant electrical storm, with the camera on a small tripod and the bulb left open for a while. We had crystal clear transparent skies overhead all night, with a great sugary Cygnus Milky Way transiting high overhead mid-evening, but there was an interesting weather phenomenon happening some number of miles north-northeast of us. As the sun was setting, we had this great view of some towering cumulus clouds catching the sunset glow to the northeast. Over dinner I thought I saw a lightning flash in the clouds. 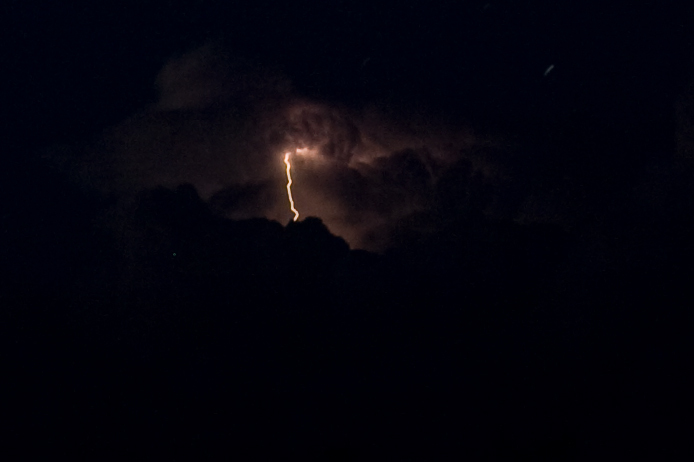 As it turned out, throughout the evening all the way to 2:00 a.m. we were entertained by a sometimes massive electrical storm that seemed to be nearly stationary. I caught this one good lightning strike off in the distance. The full-res version is a crop from the center of a very large picture. It was also to be a fun evening to see a planet grouping in the west, following the sun to the horizon. 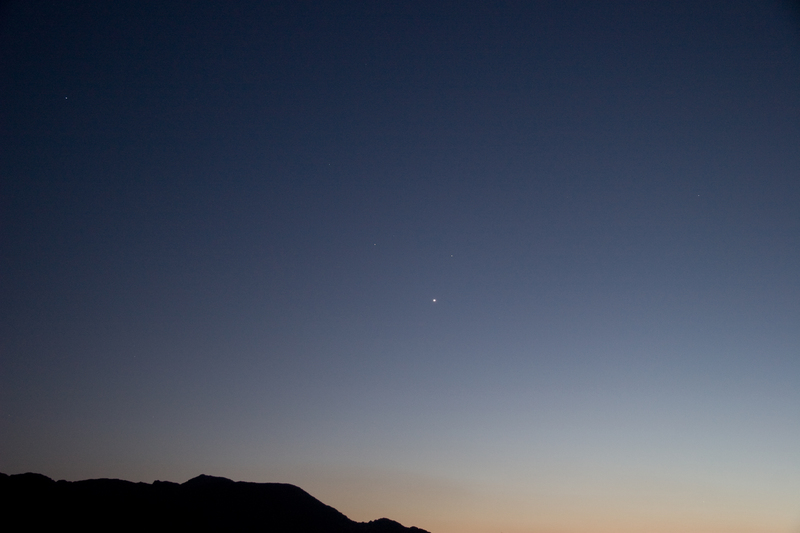 I caught this great shot of bright Venus, with Saturn to the upper right, and Mars to the left. 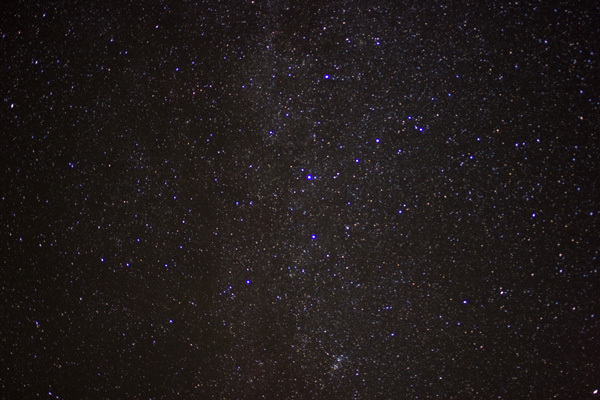 To the far left is the bright star Spica. Click to see the great full-resolution picture. In binoculars, Mercury was also visible, but deep in the red sunset glow well out of the field of this picture. In a few days the crescent moon will join the trio for another good picture. Bright Venus grouped with Mars (left above) and Saturn. Click for the full 4MB experience. I did take a couple of interesting piggyback Milky Way pictures. My focus wasn’t perfect, and the white balance doesn’t seem quite right. They are mostly untouched except for some slight darkening of the blacks. They are both five-minute exposures on my stock Canon 20D. 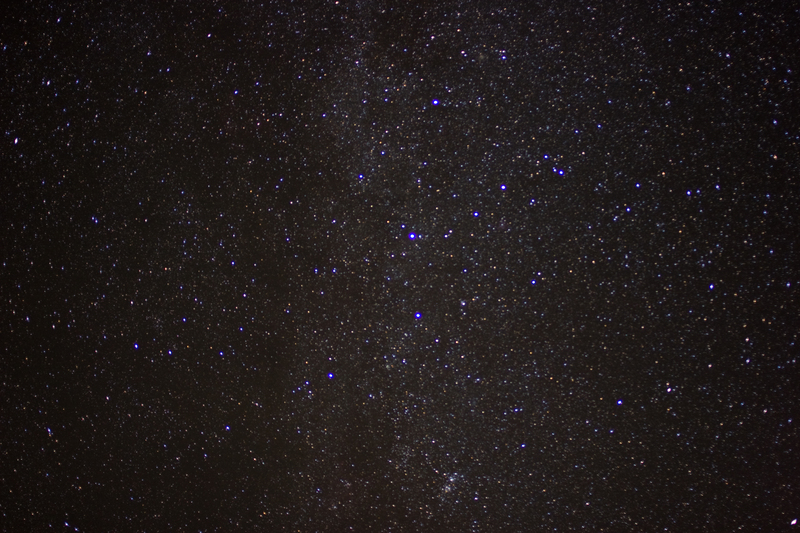 I think if this camera were modified to remove the deep red filter, the red hydrogen-alpha glow of the North America nebula would show more. 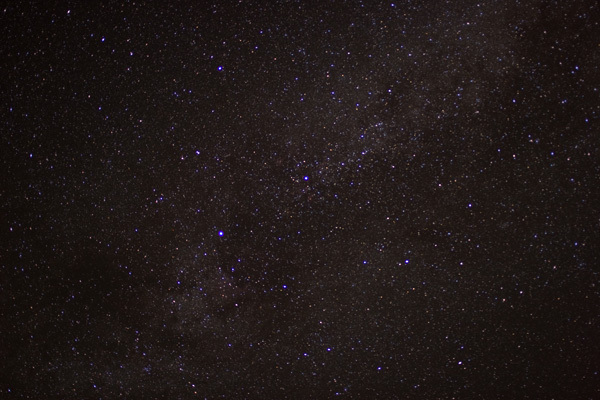 Cygnus Milky Way, north with bright Deneb to the lower left from center. 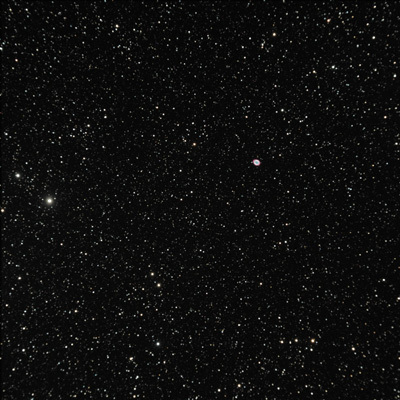 And here is a late-night shot of Cassiopeia. 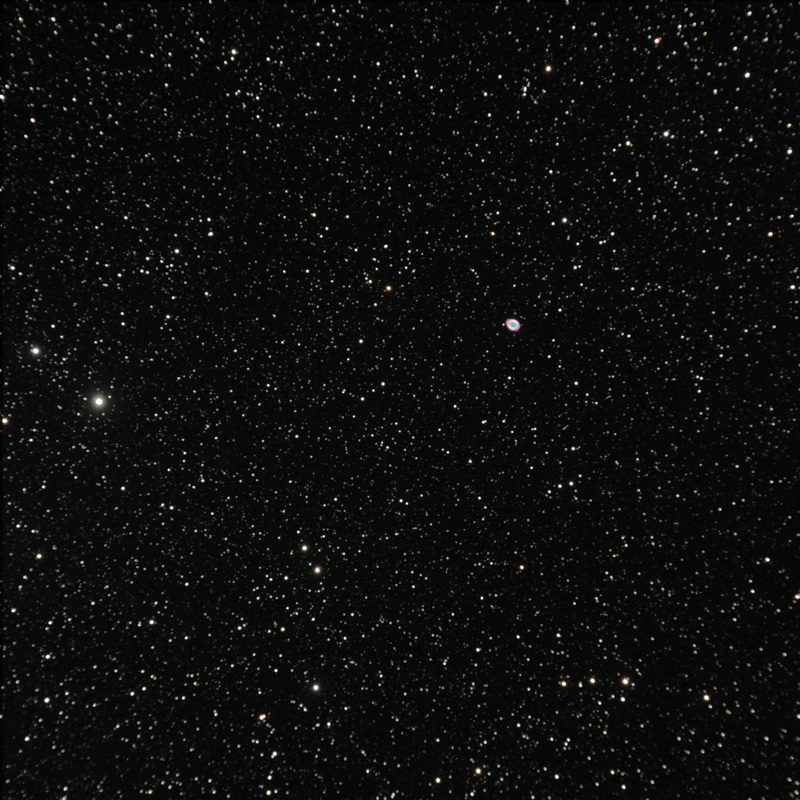 Cassiopeia reclines in the summer Milky Way. 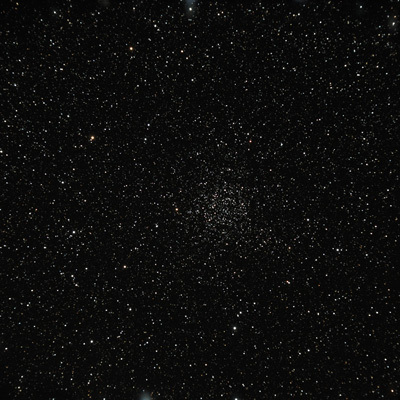 The "double cluster" is visible near bottom center. And of course I did some exposures through the Astro-Physics Traveler as well. 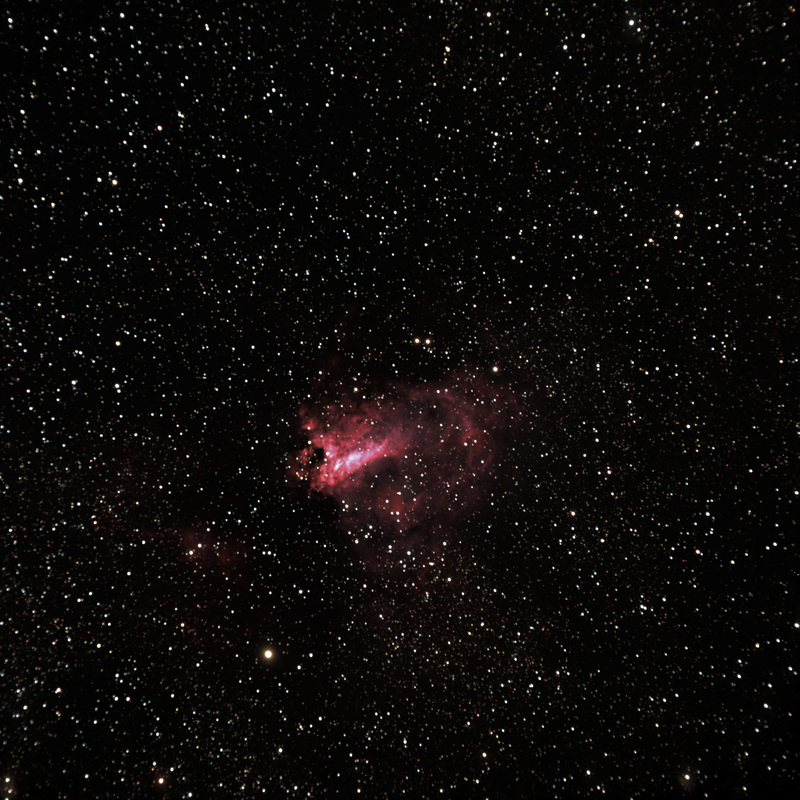 Here is the Swan Nebula, M17, four ten-minute exposures, ST-4000XCM one-shot color camera. Click on each for the full-resolution image. M17 also known as the Swan Nebula or Omega Nebula. There's the Ring Nebula, M57, just right of center. And now as you can see in a crop at full resolution, it’s not a bad image at all. This is three ten-minute sub-exposures (30 minutes total). 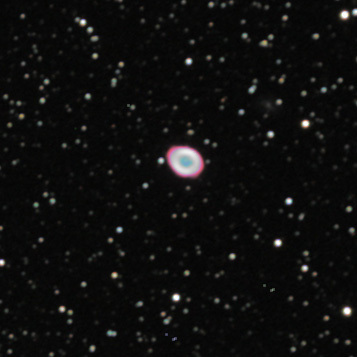 Full-resolution crop from the wide field above, M57 the Ring Nebula. 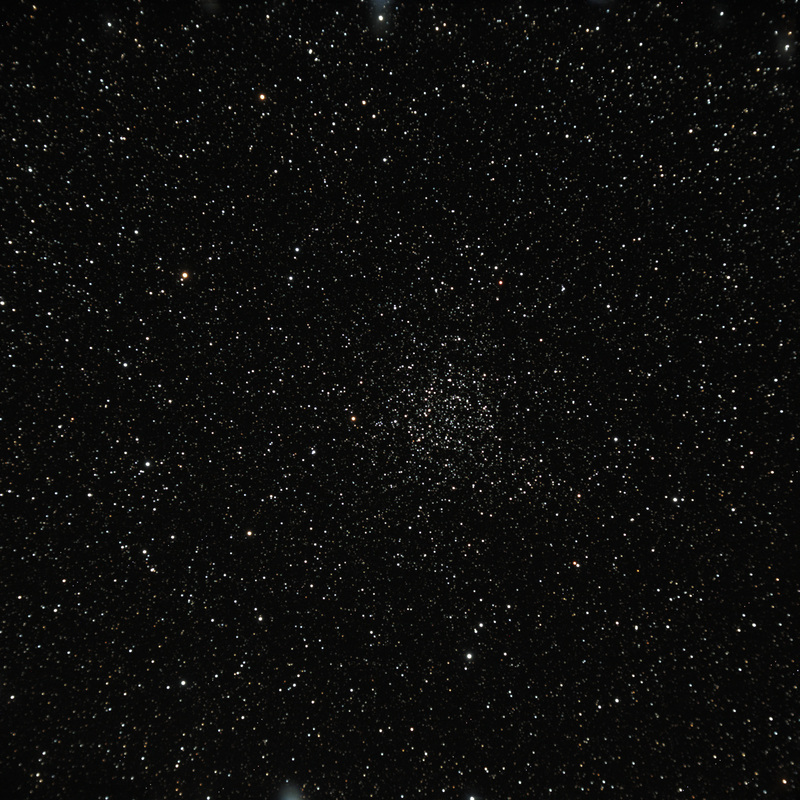 Finally I wanted to get one of Jane’s (and my) favorite Cassiopeia star clusters, one discovered by Caroline Herschel, and known as the Magnificent Cluster, NGC7789. This scaled down version is not terribly impressive, but the full-res image is a treat to swim around in. On a techy note, for the first time I started to have some issues with haze forming on the chip. Given the presence of those nearby cumulus, I guess I can’t always count on the desert air to be completely water-free. Besides the great deep sky and planets, of course we also had lots of meteors from the forward edge of the Perseid meteor shower. Jane did some great counts, and I enjoyed some bright meteors while the shutters were open. Thanks, Mojo, for the great images and commentary. It looks like it was a really enjoyable outing. Also, thanks to Jane for her emails to me on the various hoaxes buzzing about. See you soon at one of the OTSA outings in Monrovia. 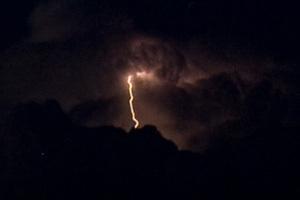 Thanks Mojo – loved the lightening shot! We saw the same show from Ford, a little further away. Also loved the shots of the ring – especially the wide field, because thats how it looks when you “find” it. That picture shows the tripod, mount, and telescope. On top of the telescope there’s a Telrad aiming device which I remove and replace with a piggyback camera mount. It holds the Canon 20D. I use a remote shutter control and remote camera controls with a pair of USB cables. 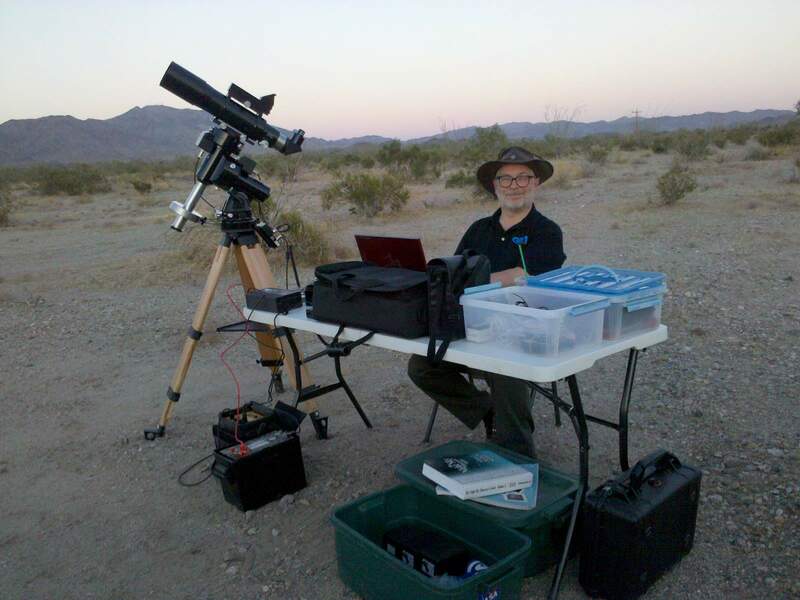 For the telescope pictures, I use an SBIG (Santa Barbara Instrument Group) ST-4000XCM CCD imager. It has a peltier cooling device that cools the imaging chip to reduce noise for long exposures. It has a 2048×2048 pixel CCD chip using a Bayer color matrix for one-shot color imaging (no RGB filter wheels required, but post-processing is necessary to extract the color and luminance signals). You can think of my telescope as a fixed 630mm lens at f/6.0. Your 540mm lens would be a fine telescope, but you’d have a couple of disadvantages for astrophotography. At high magnification, it’s important that even small movements in the mount be corrected quickly for long exposures, to prevent any star trails. My CCD imager has a second chip mounted next to the main imaging chip. I am able to pull an image from the second chip every 5 seconds or so, and my software will make small adjustments to the mount to keep it within a few pixels of dead center. As far as limited budgets go, I would suggest that you might have fun just ignoring the star trails and try some long exposures on a fixed tripod with a wider angle lens, something like a 50mm or 35mm. You’ll be amazed what you can capture with a one- or two-minute exposure. My telescope and mount are both made by Astro-Physics. The telescope is a Traveler 105mm aperture at f/6, and the mount is a Mach 1-GTO model. I hope that answered some of your questions! Let me know. This weekend while you two were enjoying the desert, I and my wife on the other hand were in Julian. We could see in the far distance flashes of lightning Norht of us. The clearity in Julian was very good and cold. You could see your breath cold at 1am. The starfest was very good. Lots of campers and telescopes.